Microsoft has signalled its intention to further diversify the Office productivity suite after acquiring LiveLoop for an undisclosed fee. 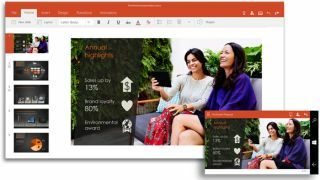 A spokesperson for Microsoft confirmed the acquisition to ZDNet, and the LiveLoop for PowerPoint program is expected to be the first to play a part in the Office of the future. "Microsoft is excited to welcome the talented team from LiveLoop to help build great collaboration across Office applications, as part of our strategy and vision to reinvent productivity," confirmed a spokesperson from Microsoft. LiveLoop for PowerPoint, its primary offering, is a program that allows teams to work on presentations inside PowerPoint at the same time as fellow employees in a similar way to Google's Slides program. It eliminates the need to use a separate meeting program, such as GoToMeeting, as you can simply share the URL and kick a meeting off from there. A message on the LiveLoop website confirmed that it will be shutting down permanently as of April 24, 2015 and all data, including presentations, must be removed by then or face being permanently deleted. LiveLoop is just the latest in a number of smaller companies that have been bought up by Microsoft including email company Accompli and calendar specialist Sunrise, Accompli basically becoming Outlook for iOS and Android.